So I decided to take the Regera out for a spin in Free Play on the Old Mulsanne Circuit, and I noticed something very interesting. 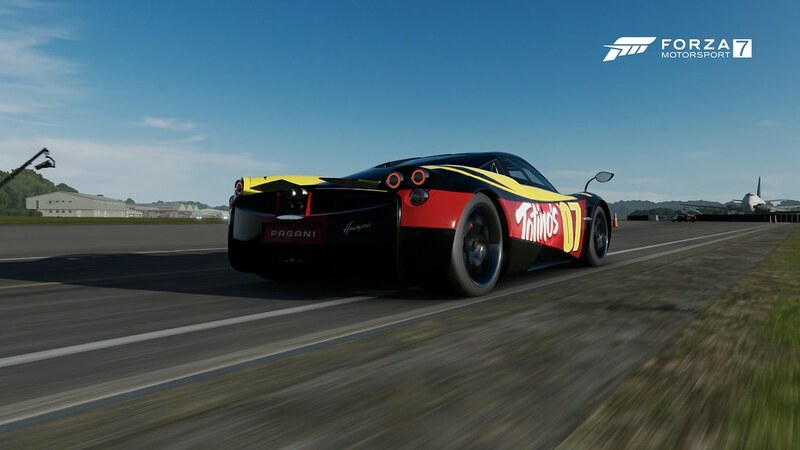 Farther up the starting grid, I caught up to two Pagani Huayras with some interesting liveries. 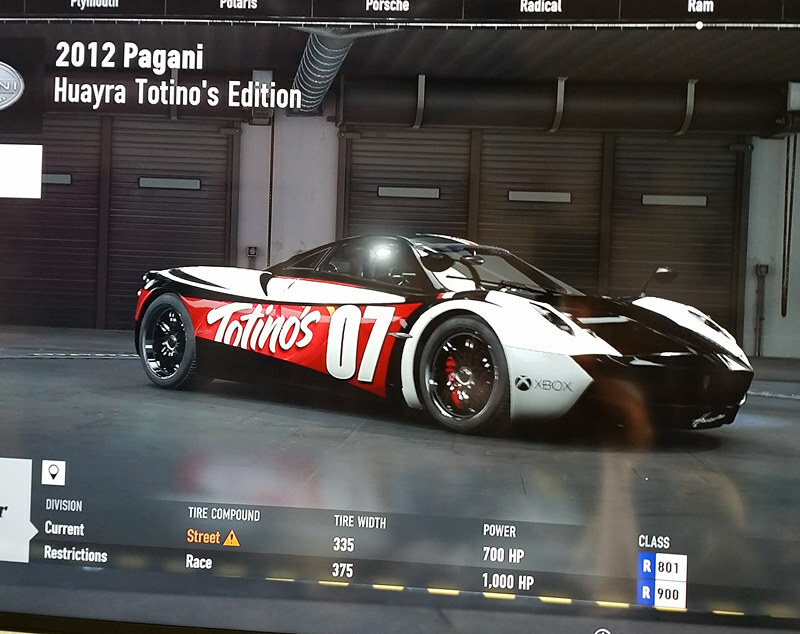 This one was called Huayra Totinos in the grid names. 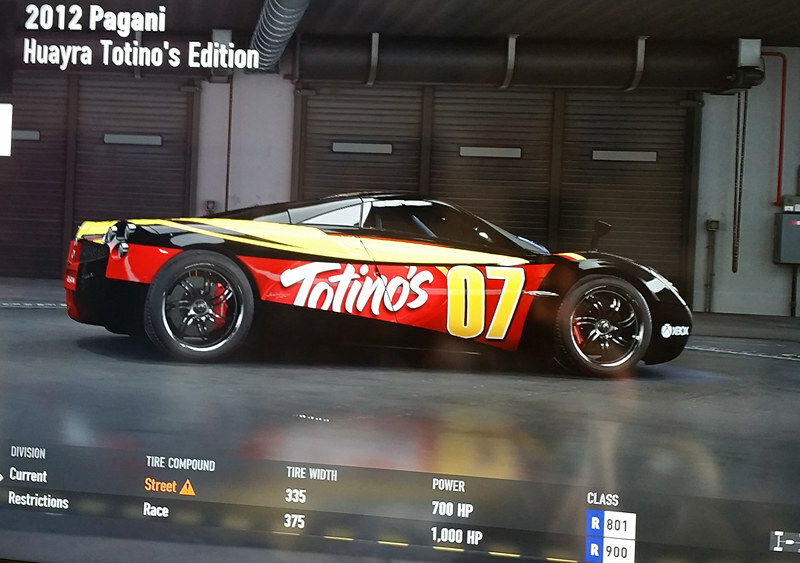 This one was called Pagani Totinos in the grid names. 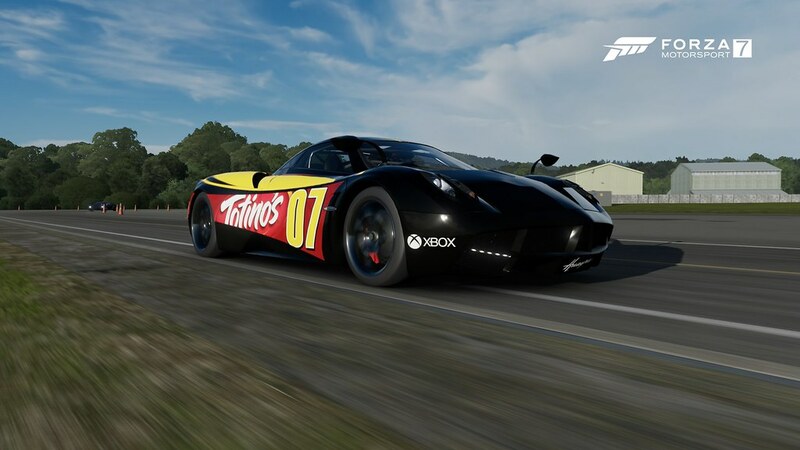 My guess is not a prize car but a promo that will happen with Totinos Pizza Product, kinda like the pringles car back in previous forzas and the pizza hut boss 302 in Forza Horizon. Sounds like I gotta go looking for this. By the look of the price stickers, the boxes pictured were at Walmart. 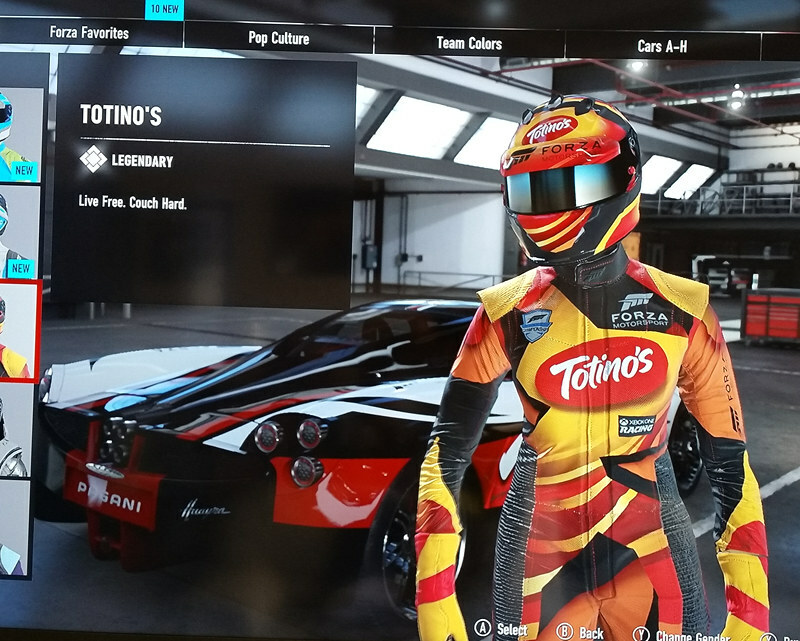 I was messing around in free play and set my class to Hypercars and drove around in the Zenvo ST1, I paused my game to see a car called the Pagani Totinos. I can't rent it and it isn't in the collection, possible DLC car? Let me know guys, I googled it and everything there is nothing. When does this vehicle come out? When will we recieve/have to buy it? Official info is at the link. It´s always so nice to see, that germans (or every non-US resident) are simply screwed, when it comes to prizing and stuff. Win a Hoonigan-voucher: nope. 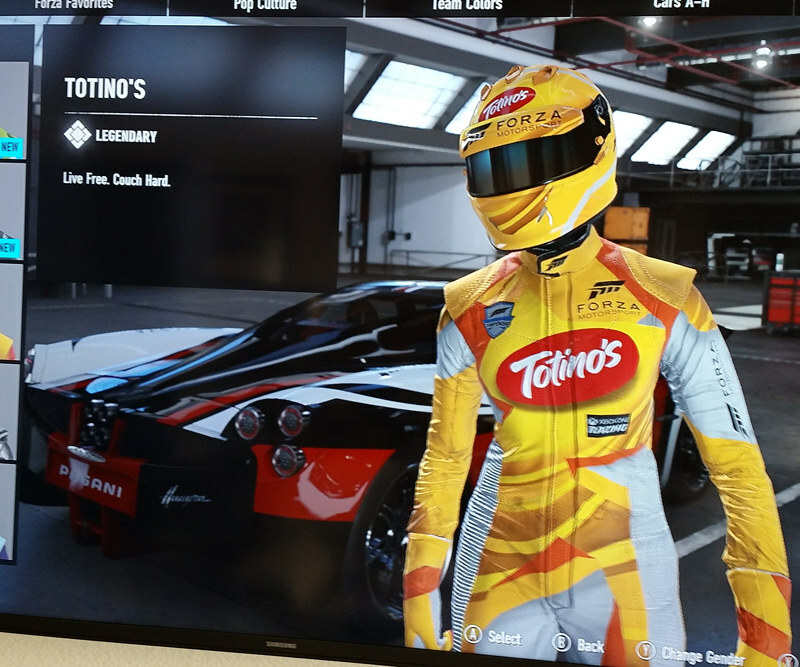 Get special liveries and gear: nope. Win a X1X: nope. (Ok, we also had some - but for me: Win sth. on FB: nope! I´m not into those social media platforms). Looks like I will be needing to break my diet for some mediocre stoner pizza. So glad we don't have Totinos here in Europe, their marketing is anoying to say the least, and their products look like dog food. For what it's worth, the car codes will still work across all regions. I was given one by a friend this morning and redeemed it with no issues. When redeemed you have to install a 10MB authentication file, and then you get to "buy" it for free in-game. It seems it is not available in canada. Lame. "Eh, well ya see, we were aboot to go get some little pizzas, and ah well you know Tim's doesn't have any eh, so we gotta go to Ehmerica and get some...."
Both huayras are identical performance wise. Both stock. No benefit over stock car other than name. You need four separate codes to get them all. Basically get code off box, enter on website, they email you download code. 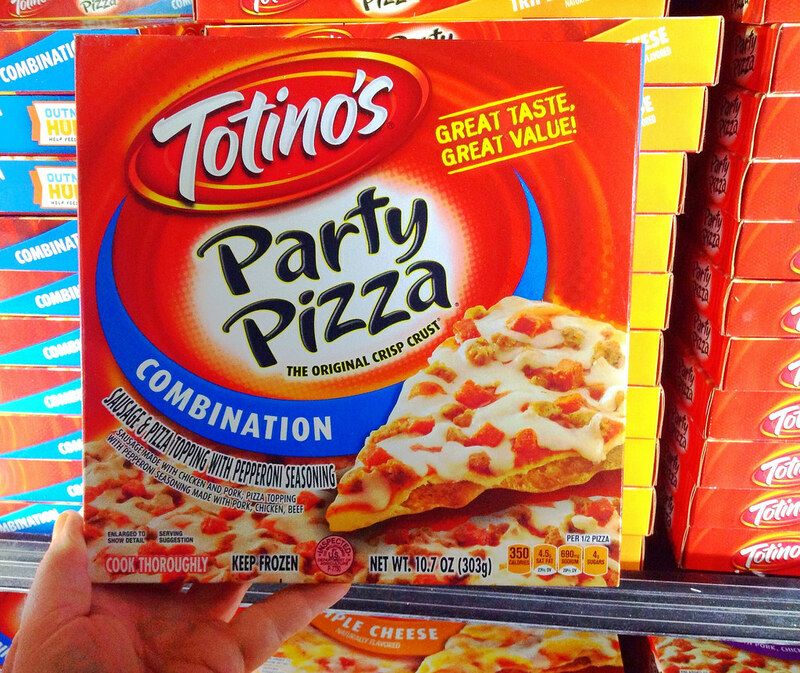 Heres the kicker: the codes are on the outside of the pizza package. You don't have to buy the pizza. Just snap pics of the box and type in the code if you so desire. Not that I recommend that because its cheating. Technically, you canucks could just get someone stateside to send you pics of four boxes. Hopefully I can sell them in open market if theyll ever open the damn marketplace because I don't need two pizza themed paganis. Also, yes. Each download is a 10mb file. Just bought some pizza rolls. Here's a code for someone.